In previous posts, I discussed deck-building strategy, Dominion strategy, game terminology, and finally specific categories of cards. Now let’s talk about different “phases” of the game. Because you may not realize it, but you can break down Dominion into different parts that have slightly different goals. Each card in Dominion may be useful in all of these phases, but many of them are more useful in some phases than others, and some may even be extremely useful in certain phases but not at all useful in others. What am I talking about? Read on to find out. This is one of the two possible first-two-hands. If you don’t realize it already, there are only two possible combinations of hands you can get in the first two rounds. (There are some exceptions with Hinterlands, but we’ll ignore those here). 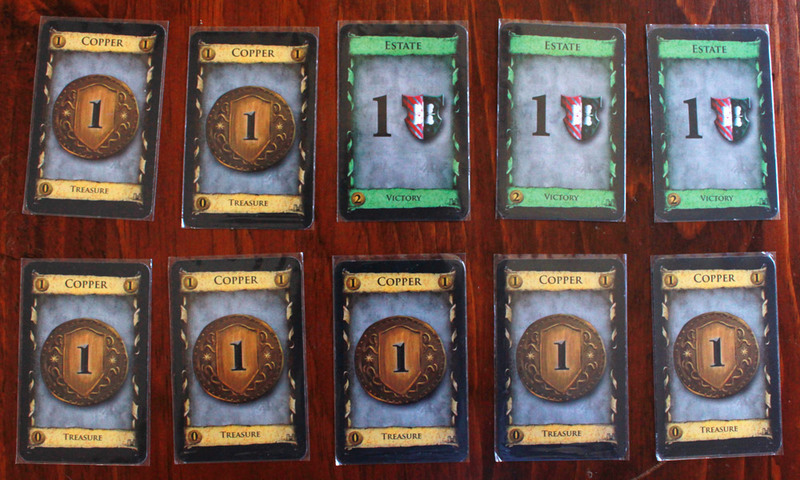 It works like this: if you get four copper in your first hand, you’ll get three in your second, and vice versa. If you get two in your first hand, you’ll get five in your second. There is no other option. If you keep this in mind, you can buy exactly the cards you need to buy and not be surprised by what you draw. Also keep in mind that the order of these first purchases doesn’t matter, since both cards with be shuffled into your deck at the same time. Seriously, there’s no other possibility. Math! At the start of the game, there are basically three things you want to add to your deck: something to trash your copper (if that option is available—you won’t always have trashing cards available), something to improve your treasure (or improve access to it), and something to put curses in the other players’ decks. Unfortunately for you, in two purchases you cannot pursue all of these – and, in fact, it’s pretty tough to run more than 2 of these over the course of the game. And you hopefully realize that you will always be doing a bit of option 2. Quite the set of worthy card-trashers. Trashing cards, is one of my favorites. It’s also tough to commit to; you feel like you’re wasting turns just trashing, but trust me, it can be quite worth it. Obviously the most efficient way to trash cards is with the Chapel, which can trash up to four at once. And it is not a waste of a turn to play Chapel and trash four coppers, or two coppers and two estates out of your hand. You will most likely have to choose between cost 3 and 4 cards that trash. Aside from the Chapel, most of those are a mixed bag. For example, the Remodel can’t do a whole lot to your Copper right away; you have to first go to, say, an Estate, which only slows you down. It’s better if you can get rid of your copper without having to replace it. Remember that when you “trash a card and gain a card costing exactly 1 more than it,” you can trash your copper and gain nothing in return. Those also tend to continue to be effective throughout the game (especially the 5-cost Upgrade), while Chapel runs out of use after you clear the Copper and Estates from your hand. Look for creative ways to trash, like Masquerade, which also gives you +2 Cards as well as passing your problem to someone else, or Ambassador which lets you remove cards from your deck and pass them to others. It is important when you go for the “trashing” option that you replace the copper you trash with silver, and then gold. If you trash away all your copper without getting any treasure to back it up (preferably silver, but certain action cards give you treasure, which is an option), you’ll be stuck without enough treasure to be effective. You need at least 3 usable treasure (from Action cards or Silver and Gold) left in your hand after you ditch all the copper, and you’ll need to rapidly boost your treasure after that. Treasure is the focus after you get your deck clean (even if it comes from action cards) because you don’t need a lot of +3 cards or anything like that to accrue copper or blow past the victory cards. Moneylender is a great way to ditch copper while still having treasure to spend, and Mine just skips over the problem of losing treasure by immediately replacing it. Keep in mind, though, that these tend to get less useful in later phases of the game. This strategy is extremely effective against attacks that give you curses; if your deck is quickly efficient, you’ll then have easy access to those curses to trash them out of your hands. However, it can be vulnerable to something like the Thief, which will become very effective against you when you have a small deck made up mostly of gold. Improving your treasure, is pretty much key to every game. You can’t be effective if you can’t do better than a few coppers. You need treasure, and you need access to it. However, in many cases you can pursue this effectively without spending time trashing cards or wasting actions attacking other players. If you focus solely on this, the best way to get a jump start on early turns is to buy something that gives you a few card draws, and buy a silver. The sooner you can start buying gold, the better, and a Smithy will go a long way toward getting you that 6 treasure early on, because even though copper is weak, having a lot of it in your hand can still get you what you need. Having a silver in your deck to potentially draw is extra helpful toward getting there. Allow me to emphasize what you should purchase. Assuming you get the 3-4 split, you should buy at least 1 silver. 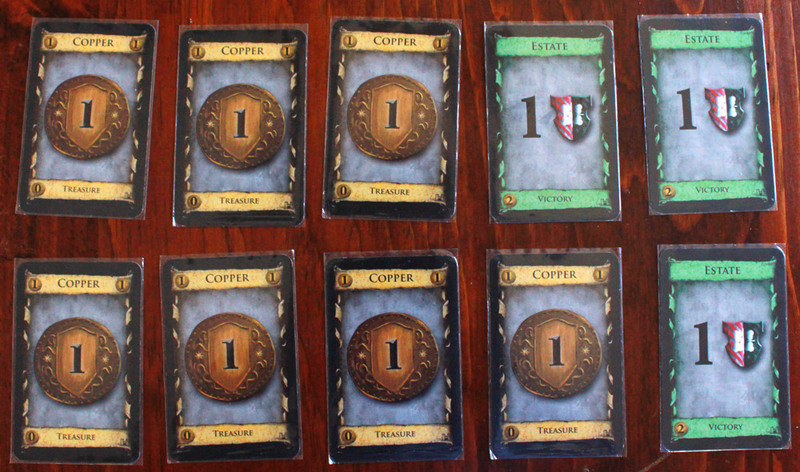 You can certainly buy two, but you will eventually need action cards anyways; you’ll want to collect copper into your hand and blow past victory cards as much as possible, so you’ll need big +Card actions, and eventually +Buys to ensure you don’t waste big treasure hands. I recommend getting a Silver plus an action card with good +Card power. +Buys are not so useful this early on because you don’t have enough treasure (with a few exception, like the Bridge). If you get the 5-2 split, you should probably go for a good 5-cost Action card. You’re lucky if the setup includes a worthwhile 2-cost card, but you can pull in more treasure the next time around. Attack cards that put curses into other players’ decks, can be a highly effective strategy. It can greatly slow down your opponent to give you just the edge you need to pull ahead. However, be cautious. Do not overbuy on attack cards. One of the best early attack cards is Swindler. Why? Early game, the chances of swindling a copper into a curse is much higher than any other time. If you hit their purchases instead, you can derail their early strategy slightly. In addition, the Swindler gives you +2 treasure, which is as important as giving your opponent the curse. It doesn’t matter how much you hurt your opponent in the long run if you don’t do anything to help yourself. The most coveted attack cards. You don’t have to ignore attack cards without a direct benefit to you; but try to focus on ones that add crappy cards to your opponents deck. An early Thief just removes copper from your opponents hand; and decks are too small early on for the “reveal and discard” attacks to be really effective. Adding early curses can slow your opponent dramatically; and over the course of the game they’ll have more effect. Remember, always keep in mind how many actions you have available. If you buy two attack cards (most of which do not have +1 action) and draw both of them in the same hand, you won’t be able to use them both. I recommend sticking to 1 Attack card, and then getting a Silver with your other pull. If you get the 5-2 split, definitely try to buy a valuable 5-cost attack card. Cards like Torturer and Ambassador are super useful to you and they do the right kind of thing to your opponent. In these opening turns, you should almost never buy two action cards, unless at least one of them has a +1 action, and the one that doesn’t does not draw cards into your hand. The chances of drawing both action cards into your hand at once is extremely high; even higher if you play, say, a Smithy for +3 cards and then get the other action in that draw. One exception is the Throne Room—although if you buy that, the risk is not drawing it in the same turn as your other action card, which wastes some space in your hand. In the interest of this article not getting too long, the next part of this series will focus on the remaining phases. Previous ArticleFDQ: What Game Causes AP for You?